Soughdough, in my humble opinion, makes excellent toast. But have you ever tried a sourdough croissant? Me neither. Till today. At Irrewarra Sourdough Cafe, 10 James Street, Geelong, Tel +61 3 5233 6219. Everything they do is sourdough. They even have a special "Breakfast Seed Loaf" with pumpkin seeds, sunflower seeds and linseeds, all rolled in sesame seeds. It rocks. The croissant wasn't bad either. Unfortunately, however, the breakfast window slams shut at noon, so I was refused the chance to enjoy eggs on toast. But I liked the sound of the soft boiled eggs with wholewheat toast fingers and screaming seeds dukkah. They also do their own oven baked granola. Having consumed about 500 champagnes and a few cleansing ales the night before, I was very much looking forward to this morning's eggs. Luckily, Athelstane House, 4 Hobson Street, Queenscliff, Tel +61 3 5258 1024, didn't disappoint. Excellent scrambled eggs, exotic mushrooms (no, this is not a euphemism for the hallucinogenic variety), tasty bacon roll-ups, and grilled tomato. BnB's ain't what they used to be. Great food, and not a doily in sight. Our set menu (included with a night's stay) gave us a choice of 3 cooked or 2 "Continental" breakfast dishes, plus T2 teas, coffee and Emma & Tom's "life juices". You could also splash out extra for a glass of Chandon bubbly ($9) or a Bloody Mary ($12), but in my fragile state I decided that Mary was best consumed as a virgin, sans vodka. Although we only tried the eggs & bacon, I did eyeball the 3 egg breakfast omelette (looked good), and the mushrooms on toast with cream and parmesan (also looked good). The other dishes were house-made muesli and cinnamon porridge, plus Irrewarra sourdough toasts. The breakfast room at Athelstane is light, stylish and modern, with timber floors, bentwood chairs, white linens and brown paper overlays. Service was quick, too. 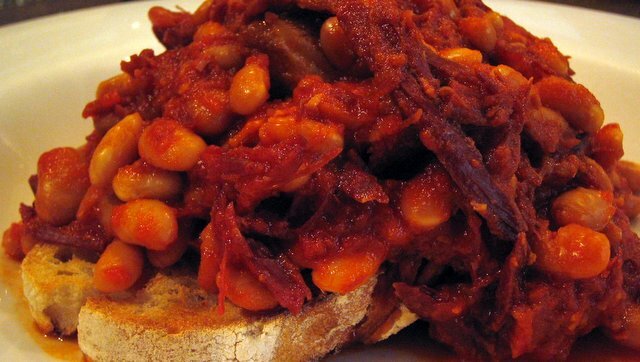 A very hearty, meaty, serve of ham hock beans on sourdough toast at European. It's a big, tasty dish with a rich tomato sauce, but some of the meaty bits were a bit stringy. It goes by many names... French toast, German toast, freedom toast, pain perdu, the poor Knights of Windsor, and more. Dunked in egg, even stale bread tastes good. If the bread happens to be fresh, even better. For a savoury version, Benito's is hard to beat: fat spongy slabs of French toast served with parmesan, grilled bacon and some tomato relish (you have to ask for the relish). Delicious. It turns out that size doesn't matter after all. It's all about performance. Admirably demonstrated this morning (this afternoon actually) at Cafe 3A, 3A Edward Street, Brunswick, Tel +61 3 9380 4996. The venue is tiny. 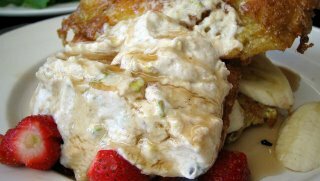 The "Pistachio Poached" breakfast was very good. And the Ethiopian Gold coffee was superb. 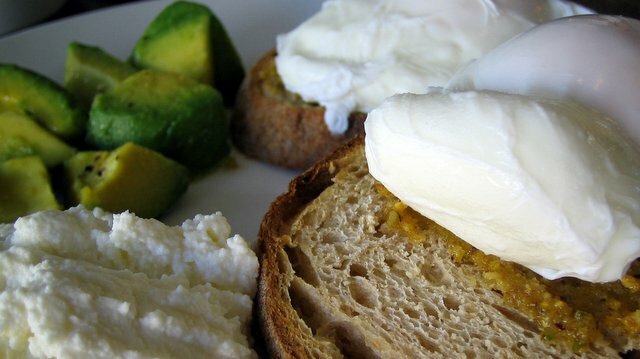 I enjoyed my "lemon butter pistachio pesto spread on sourdough with two poached eggs, whipped ricotta and preserved lemon and avocado salad." But as good as it was, the the menu made it sound so good that the actual dish struggled to live up to high expectations. The flavour of the lemon butter pistachio "pesto" was too subtle. It lacked the tasty kick you get from traditional garlic-basil pesto. And neither the whipped ricotta nor the avocado managed to fill the flavour void. Call me picky. I reckon a better option might be the Olivada Poached, served on sourdough with olivada, fetta and capers (a bargain at $7.50). 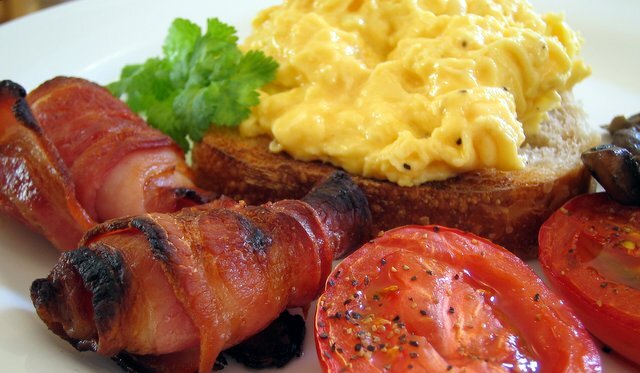 Or maybe the scrambled green eggs and ham with salsa verde, bacon and slow roasted tomato. 15/20 "is small, is good"
For some reason, every time I see a Bomboloni my subconscious starts singing that old Gypsy Kings tune... Bomba-lo-niiii... Bomba-lo-niii... la la la la la la la la la la la la la la la la la laaaa... As you can see, Spanish is not my strong point. 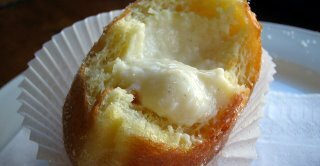 The other thing that happens every time I see a Bomboloni is that I eat one. This morning, this happened at Dench's Bakery Cafe, 109 Scotchmer Street, North Fitzroy, Tel +61 3 9486 3554. With places like this, it's easy to see why our friends from Sierra Leone might want to stay in Melbourne. In truth, I didn't really need a Bomboloni. 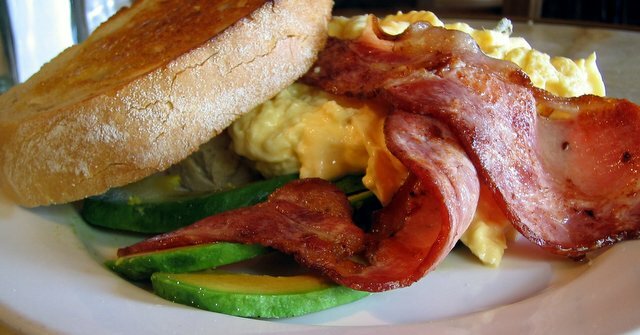 I had just wolfed down an excellent plate of creamy, chive-scrambled eggs on toasted brioche with a side of bacon and avocado. But in the interests of giving this review greater depth, I decided I should try something other than eggs. As you'd expect, Dench's excels at pastries and toast: croissant (plain, chocolate or filled with ham, cheese and tomato); sweet and savoury muffins; egg and bacon pie; mushroom and thyme pie; stoneground toast; raisin toast; olive toast; fruit bun; escargot; and more. The venue has a good buzz, but it's a tight squeeze and probably not ideal for groups bigger than 3 or 4. And I challenge anyone not to buy a loaf of bread as you leave. There's something I've been meaning to rant about for some months now. So here goes... In 2005 (and no doubt in many previous editions), the Good Food Guide had some handy little icons that let you see at a glance if a place was good at something. Good at breakfast? Get an egg cup. Good value? Get a dollar sign. That kind of thing. This year, they decided that was too easy. Far better to bury useful information (like who's good at what) deep in the index, where the punters have to work for it. 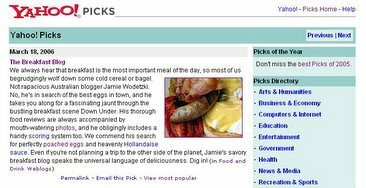 And so it was, deep in the index, that I discovered a mysterious list called "good breakfast". And on that list was a place called Dalmatino, 280 Bay Street, Port Melbourne, Tel +61 9645 6584. If that's a good breakfast, I'm a Dalmation. As it happens, the only Dalmation sitting at our table was my Dalmation Breakfast. 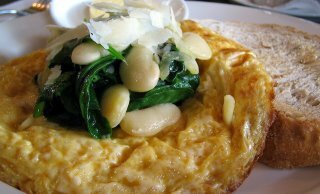 An over-cooked frisbee omelette with a damp splodge of spinach and some bland beans nested in the middle, and a few shavings of parmesan on top. Match it with under-toasted toast and you have a dish that's equal parts dull and boring. A bit of a dog, really. We also ordered poached eggs and spinach, with similarly disappointing results. The eggs didn't seem very fresh (they didn't hold their shape), and the toast was soft and soggy. The service wasn't much better. First, they served eggs and bacon, not eggs and spinach. Then, they took forever to serve the Dalmation Breakfast. Indeed, they had time to replace the bacon with spinach, supply a second piece of toast, and fetch some butter (3 trips to the kitchen) before they managed to deliver my omelette. A problem in kitchen, apparently. No kidding. About the only good thing is the venue, which is very slick indeed. Dark tables, bentwood chairs, high warehousey ceilings and cool lighting. Maybe Dalmatino is good for a meaty Croatian-style lunch or dinner (the Good Food Guide certainly thinks so), but breakfast? Perhaps I should have tried the sausages? It's all happening in Melbourne right now. The Commonwealth's best athletes are in town for some world class lawn bowls, ping pong and synchronised swimming. Moomba's on. The Queen's coming. Words can't describe how exciting it is. So before they shut down every useful road in the inner city area, I decided to sneak in a visit to St Kilda for breakfast at Banff, 145 Fitzroy Street, Tel +61 3 9525 3899. Although I had no complaints with my plate of scrambled eggs, bacon and avocado (all very good), the Banff menu seems strongest on the snacky stuff. Housebaked muffins. Bagel with smoked salmon and cream cheese. Ham, cheese and tomato melt. BLT on Turkish. And a bacon and egg sandwich with chutney and rocket. All sounding very tasty, and all under $7.50. Service is friendly (if a little slow at times), and the venue has a worn but cosy feel. If you happen to be a military historian, you'll be interested to know that US soldiers commandeered the place during the World War II. Beats Baghdad, I s'pose. It's Thursday morning and I here I am in Manuka, right across the road from Minque, formerly La Grange, the site of many a big Wednesday night on the turps for pollies and staffers alike. Indeed, it was at La Grange that Mark Latham (Labor polly) first met his second-wife-to-be, Janine Lacy (Liberal staffer). These days, the political crowd has migrated to the Holy Grail, down the road in Kingston, and the Lathams seem to have moved on to the Campbelltown Hungry Jack's. But Manuka still pulls the crowds with its cluster of cafes. Or, to be more specific, its cluster of cafes, and one "coffee lounge". 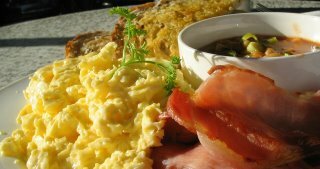 And so I settled in for eggs, bacon and beans at Charmers Coffee Lounge, 42 Franklin Street, Tel +61 2 6295 1848. Two things struck me about Charmers. 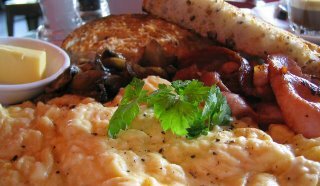 First, the food was better than I expected, especially the light-as-a-feather scrambled eggs. Second, the prices were even more of a rip-off than I expected. $17.50 for smoked salmon eggs benedict. That's more expensive than the Bot. And this place is no Bot. But just because the food was better than I expected doesn't mean that it was great. The bacon, for example, was soft and limp and not at all crispy. And the "Tijuana" beans were just beans with a few bits of spring onion and some chilli thrown in. It was good to see "Hot Waffles" on a brekky menu... surprisingly rare these days. The potato stack sounded good too... layers of potato, bacon, avocado and tomato finished with basil pesto oil. Pretty much everything is red at Fifi Foveaux's, 428 Crown Street, Surry Hills, Tel +61 2 9380 6881. From the hats of the gnome stools to the perspex chandeliers and all the wallpaper in between. Except the scrambled eggs, of course. They were a creamy yellow colour. 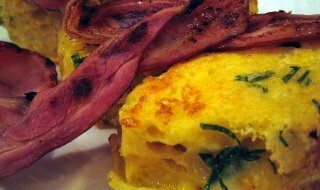 And what a luscious plate of scrambles they were. Soft, rich and slightly cheesy. Delicious. The bacon and mushies were pretty good too, as was the multi-grain toast. And a small dish of HP sauce was delivered on demand. Hard to fault really. Fifi does a couple of omelettes, with fetta, tomato and spinach, or with smoked salmon, red capsicum and spanish onion. Then there's smoked salmon benedict (but apparently no ham version), a bacon and egg roll, and a BLT with home-made pesto mayonnaise. Sweet toast also seems to be a specialty of this place. Choose from sour cherry toast, banana and walnut toast, or toasted coconut loaf. Or get some plain white toast and smear it with ricotta and honey. If nothing else, it's worth coming here just to make the claim that you once ate breakfast with a gnome's head pressed firmly to your backside. To cap it all off, Fifi is cheap. Nothing over 10 bucks. 16/20 "who's been sitting on my gnome?"